If you are anything like me, you probably have a stash of Vicks VapoRub in your medicine cabinet and just the smell of it could bring back childhood memories. Vicks VapoRub has been used as an age-old mentholated topical cream intended to relieve throat, head and chest stuffiness. But don’t dust it off as just a cold or flu remedy. This wonder potion has many uses, especially if you a new parent running around your little one. 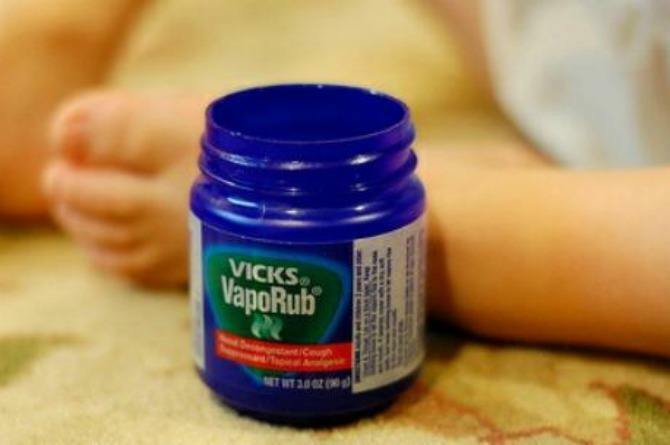 Vicks is a great remedy for cracked heels and even eczema. Generously rub this odiferous ointment on the cracks of your feet, massage it and cover them up with socks. This locks the moisture in the feet. Wash your feet with some lukewarm water the next day and repeat the process if necessary, to maintain healthy and crack-free heels. Dirt accumulated on the bed of your fingernail can lead to a fungal infection. This causes the nail to thicken and discolour; and this thickening can push the nail away from the toe, possibly causing loss of that nail. You can apply some Vicks on this fungus-infected once or twice a day onto the area since it has a fungus-fighting ingredient called thymol. Trim your nails regularly till the infected toenail is entirely removed. Running around your little one could leave you exhausted and achy. While there are oil massages you can try, Vicks can provide you fast relief from aching and overtired muscles. Gently rub the ointment on to the affected area, this will increase circulation and provide instant relief. You can follow up this massage by covering the area with a warm towel. Vicks VapoRub has menthol and camphor, both of which have antiseptic properties. If you or your little one get paper cuts or splinters on your feet, hands or any other part of the body, you can simply rub the ointment onto the affected area. It will speed up the healing process and leave you feeling relieved. Continue reading to know more benefits of using Vicks Vaporub. For minor burns and injuries caused due to cooker steam, or burns due to hot plates in the kitchen, you can run the affected area under cold water and quickly apply Vicks onto that area. This will prevent further burning effect on your skin and will cool down any burning sensation. Vicks VapoRub can also be used as a topical analgesic to relieve pain and aching muscles, especially if you are suffering from tennis elbow. Simply massage Vicks onto the area. This will help you get rid of the pain and speed up the healing process. Vicks contains menthol and camphor which are responsible for quick healing of a tennis elbow. This odiferous ointment can also be used in special types of humidifiers and vapourisers. Simply ensure that your humidifier has an aromatherapy compartment and add some Vicks to it. The humidifier will circulate this air and will let you sleep breathing easy all night. Another option is to add Vicks to hot water and inhale it before going to sleep. If you are suffering from breakouts and stubborn pimples due to hormonal changes, Vicks is an effective treatment to get rid of them. Vicks contains acne-fighting ingredients like eucalyptus oil and camphor. You can simply dab a bit of Vicks on the affected area and leave it overnight. It will automatically shrink the acne. If you are bitten by a bug or a tick, apply Vicks to the affected area immediately. The strong smell of menthol will get the critter to release itself from your skin. It is a known insect repellent, which you can dab on your clothes and small amounts on the back of your knees, ankles, wrists, inner elbows, behind your wrist. Vicks VapoRub is also a mosquitoe-repellent. Dab some Vicks onto your skin and clothes before heading out or even at home. If you get bitten, you can apply some Vicks onto the affected area and follow it up by taping a band-aid to stop the itching. Also, it's strong odour and properties of eucalyptus oil keeps the mosquitoes away. Though it has many uses (apart from being the go-to remedy for cold), avoid using Vicks VapoRub on your newborns or toddlers. Studies have shown that the ingredients in the ointment can irritate the baby's airways and even increase mucus production.